There’s not much left to pick at after Demetrious Johnson's most recent -- and most dominant -- victory. 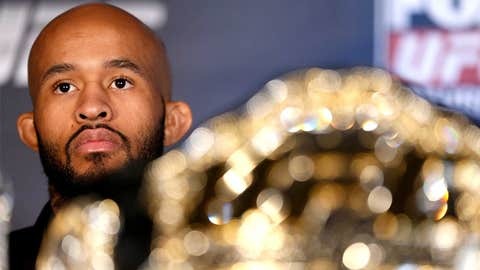 Suddenly, for Demetrious Johnson, it’s no longer just about speed. It’s no longer just about footwork or transitions. Power is part of his game, too. If you’re a UFC flyweight, you can be forgiven if you’re scratching your head right about now. And if you’re a critic, you’re running out of things to nitpick. Ironically, that was supposed to be the one thing that "Mighty Mouse" wasn’t gifted with. That was supposed to be the one void in his game that opponents could step into and exploit. Perhaps no more. Benavidez, after all, came into the UFC On FOX main event as the thumper, the intimidator, the one with the one-punch finishing power. In five fights as a flyweight, he’d come in with four knockdowns, three knockouts, and a reputation for putting leather on chins. After all, his career knockdown rate was double the UFC average for all divisions. Early on, it appeared Benavidez was comfortable in the adjustments he’d brought to the rematch of their Sept. 2012 fight. Instead of chasing around the speedy Johnson as he did the first time around, he took the center of the cage and waited for Johnson to come to him. Now, he has pop in his punches? Mercy. That seemed perfectly reasonable, but as it turned out, that was playing right into Johnson’s hands. Or at least his right hand, as Johnson stepped in with a hook that put an end to Benavidez’s night with a quickness. "That’s one of the things we’ve been trying to work on, is me settling my feet and really trying to let go of my power," Johnson said during the post-fight show on FOX Sports 1. If there’s been one knock on the flyweights, it’s been a lack of finishes. But Johnson, who took it to the judges’ scorecards in each of his first seven fights, has suddenly stopped two straight opponents. His first one, against John Moraga, won over only a few doubters, since Moraga wasn’t widely known ahead of time. But this one? This was a shocker. After all, 2013 has been the year of Benavidez’s camp, Team Alpha Male. If you’re a UFC fan, you’ve been hearing about the success brought about by the addition of new coach Duane "Bang" Ludwig, whose specialty is striking. Ludwig was the one who was supposed to help bring Team Alpha Male over the top when it came to finally earning a championship. They had lost so many times before, Urijah Faber and Chad Mendes, and Benavidez, too. With Ludwig at the helm, the team was in wrecking ball mode. Benavidez had gone 3-0 with two KO’s in 2013. So had Chad Mendes. Urijah Faber had gone 4-0 with three finishes. They were on fire, so this time was supposed to be different. All Benavidez had to do was stuff the takedowns and use his newly rediscovered striking confidence and newly found combinations to bring the gold home. None of this took into account what adjustments Johnson would make. It’s sometimes easy to forget that champions are not finished products. Even though they are the best, they, too, can still improve. That is especially true for Johnson, who up until two years ago, was still working fulltime and training in his spare time. It was only when his coach Matt Hume told him to quit, telling him he’d become the world champion, that Johnson went all-in. It’s sometimes easy to forget that champions are not finished products. In short order, Johnson has reached the point of being one of the most complete fighters in the sport. His game is sublime. He is remarkably active, leaving few quiet moments in a match. He is an accurate striker and rarely gets cleanly hit. He is a takedown artist who routinely stops opponents from doing the same to him. He has stamina for days. And now, he has pop in his punches? Mercy. That this night came the day after Georges St-Pierre walked away from the fight game is in some ways fitting. Johnson is the heir to the gentleman champion role that St-Pierre carried so well for so long. Soft-spoken and polite, he rarely has a negative word to say about anything and neatly goes about the business of self-improvement. That’s been borne out in each of his fights since becoming the champion. When he first won the belt, no one had any clue that he’d last very long. He was too small, and too ordinary and couldn’t finish, the complaints went. But he’s shown a certain resolve, an ability to improve in the gym and make adjustments in the cage, from surviving John Dodson’s assault to beating Benavidez at his own game. The difficulty in being champion is that you can’t look in every direction at once. Inevitably, something coming your way will arrive undetected. Johnson’s biggest strength is in surviving and adapting a new approach to those sudden problems. And now, another strength might be his actual strength. He was hard enough to beat when he was just fast. With power catching up to his speed and analytical thinking skills, this Mouse really is Mighty.